Ashley, a junior at Life Learning Academy (LLA), a Treasure Island-based charter high school, has recently experienced a change of heart. 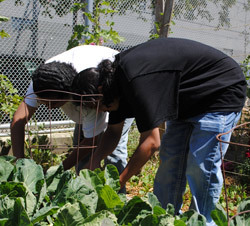 The garden at LLA isn’t new; the school has ongoing classes that grow and deliver produce to low-income residents on Treasure Island. A greenhouse was built a few years back by students at this project-based school; however, LLA has rarely had the resources necessary to use it to its full potential. T hanks to Schoolyard to Market, a collaboration between CUESA and the San Francisco Green Schoolyard Alliance, the greenhouse has been put to good use this spring. LLA and a second school, John O’Connell High School, are participating in a pilot semester, designed to blend gardening with job skills training. The program provided funds for additional garden staff and other crucial resources at both schools*, and the students have been preparing for sales days at the market. They’ve taken field trips to Ferry Plaza farms, including Achadinha Cheese Co, Flatland Flower Farm, Little Organic Farm, and Devoto Gardens, and they’ve heard advice about running a successful business from farmers and other experts. Of course, some of the greatest benefits of gardening are even harder to quantify. 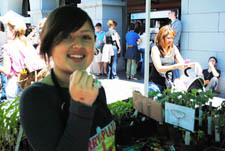 On a recent Saturday in the market, Nikko, another LLA student, had this to add: “Gardening takes a lot of patience. I get impatient, but then I go and shovel something.” At this point he turns to his teacher, Karuna Schweig, with a question. “What is it that’s in the soil?” She tells him about a new study that says digging in the dirt can release serotonin, and he nods. * Funding for the pilot semester was provided by GGS Foundation, Tacolicious, Clif Bar Family Foundation, Jessica Goldman Philanthropic Fund, Rabobank, Cooking Channel, Cut Loose, Analisa Naldi, and anonymous donors. 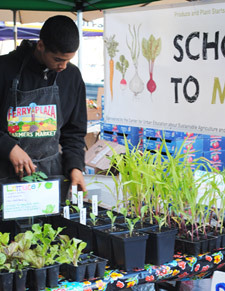 If you’d like to make a contribution to support the continuation of the program visit CUESA’s donate page and write: “Schoolyard to Market” in the message field.